Nobody likes your typical English tourist. They are loud, they drink too much and they have awful, awful, uncontrollable children. There is another type of English tourist though, albeit far less noticeable than the first. These are quiet, respectful and usually interested in doing more in their holidays than just finding the nearest pub that’s showing Only Fools and Horses. Over the years the Big Bash has seen both types of English tourist, from Ravi Bopara (the bad sort) to Luke Wright (the good sort). So just how do this season’s lot measure up? Kevin Pietersen – The obvious place to start, KP started his season by hitting 66 off 46 balls in the competition opener against Adelaide. Even at the time it looked a pretty laborious effort, as he, in his first innings in yonks, struggled to hit the ball off the square most of the time. This impression was only further reinforced when Tim Ludeman spanked 92 off two fewer balls in reply. KP subsequently followed this up by scoring one in his next innings, before buggering off home for Chrimbo. So far, a qualified failure, but there is still time to improve. Possibly. 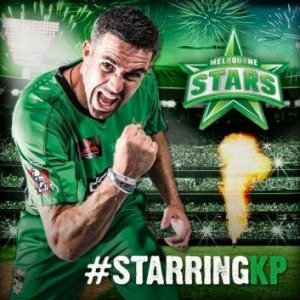 We suspect KP mocked this up himself on Photoshop. Luke Wright – Once the golden boy of 51allout and the Big Bash alike, his star has faded somewhat of late. Scores of 45, 13 and 33, all at a decent rate, have been a solid return, but hardly earth-shattering. It’s getting to the point now where people (i.e. us) are beginning to wonder if he is worth expending a precious overseas spot on anymore. How times change. Michael Lumb – The man most people expect Luke Wright to become in the very near future, Lumb contributes with a handy 20 or 30 most games and then subsequently gets out, leaving all to wonder whether he’s actually worth the effort. Scores of 28, 44, 27, and 8 have only entrenched this opinion. Honestly, most of the time we forget he’s even playing, as – we suspect – does Mrs Lumb. Riki Wessels – A late call up, Wessels’ performances (22, 50 and 28) have been better than the numbers suggest. His switch hitting in particular has impressed, and rather surprisingly (for a sort of English import anyway) he hasn’t been a complete liability in the field either (probably owing to his mixed Australian/South African heritage). So far he gets a pass mark. Eoin Morgan – Ah, but this guy doesn’t. Michael Hussey did very well to maintain a straight face when asked, after Morgan’s last game in the competition, how losing his services would impact the team. Totals of 12, 6, 7, and 15, most at an excruciating pace, suggest the Thunder will be happy to have seen the last of him. His replacement in the squad, Jason Roy, will definitely be an improvement. Even if only because he couldn’t possibly be any worse. This of course bodes fantastically for England in the forthcoming World Cup. Morgan displaying the sort of energy and enthusiasm that made his season with the Thunder such a success. Michael Carberry – Oh dear. It’s hard not to feel sorry for Carberry. Thrown away like a used tissue by the ECB after the last Ashes, he didn’t have the greatest of 2014s, and to top it all off he turned up in Perth desperately out of form and has looked awful throughout. Really awful. Hopelessly out of his depth awful. He redeemed himself a touch with 69 not out in his last appearance, but even then his slow scoring rate meant the Perth Scorchers still ended up getting trounced. Hardly enough to distract the average Perth Scorchers fan from the broken slush puppy machines, but vaguely endearing in a ‘if you don’t laugh you’ll cry’ sort of way. Andrew Flintoff – So far we’re going to call Flintoff a qualified success. Not that he’s been any good (he hasn’t) but given that our expectations of him were so low, the mere fact that he’s been able to turn up, roll the arm over a few times and hit a few balls without collapsing into a big sweaty lump, has been somewhat impressive. Whilst we’d never suggest he has shown anything so far to warrant an overseas spot, on the whole he’s been ok. Plus he seems to be genuinely enjoying himself. Which is nice. Plus his stint in Australia hopefully keeps TV executives from making more series of ‘A League of Their Own’. Alex Hales – Always save the worst for last. Hales (the future of English limited overs cricket) has been utterly wretched so far in this season’s tournament. Not only has his batting been rubbish, his fielding has been (if it’s at all possible) even worse. The rumour is that bowlers around the world have ‘figured’ Hales out. By his performances here we can believe it. Currently we have Hales, the former best T20 batsman in the world, set to morph into Luke Wright into a few years time, which means his final evolution into Michael Lumb should come in around 2019 or so. A rather rare photo; Hales actually batting in the season’s Big Bash. And so there you have it. The performances of England’s players in this year’s Big Bash honestly hasn’t made for very uplifting (albeit highly amusing) viewing. And this is hardly set to improve in the near future, given the newest addition to their ranks will be Ben Stokes. Whether their poor general performance is due to the players being out of form, or simply out of their depth, is hard to tell. But it does suggest that Michael Vaughan’s latest harebrained scheme, that in future Big Bash tournaments a team purely comprised of English players should be fielded, would result in the single worst professional sporting outfit the world has ever seen. We can’t bloody wait. It’s a tribute to the power of England’s one day set-up that they’ve turned Alex Hales, just about the best T20 batsman in the world beforehand, into the broken shell stinking up the Big Bash. Hopefully he’ll use it to find form before the World Cup, but at the moment that looks about as likely as Ian Healy making an intelligent remark. KP is the cutest. I bet he has a strong grip.